Thanks for the fantastic adventure that I’ve been able to experience thanks to your team. It was an adventure with a capital “A”. Real Africa for a lover of the unexpected. 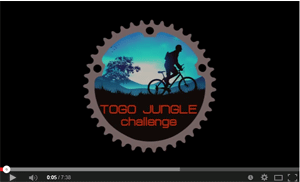 I want to thank and congratulate you with your first edition of “Togo Jungle Challenge”. The ever persistent commitment of both of you gave me more energy than all the Energy drinks. Your laughter and applause at the arrival revitalised me more than any drink. 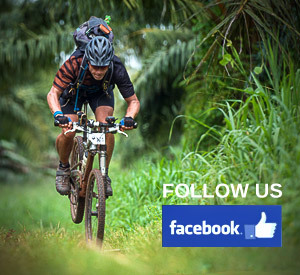 Extraordinarily beautiful MTB tracks and bivouacs. Your experience made me feel safe and in good hands. Everything was well thought-out. I’m very glad I was there and my enthusiasm will be spread. I wish you the very best with the following editions.. See you next time! My personal thanks to Gert and Elisabeth for this, for me, memorable event. The two most intense weeks of my life. Wim van Gastel from Essen, Accountant. Thanks for this wonderful MTB-adventure! After being back in Belgium for 2 cold weeks I effectively realised what we have experienced: Extreme suffering due to the heat, saddle-sore, beautiful nature and ever friendly people who have less but probably are much happier than us! most intense holiday ever! I truly want to thank you for this wonderful trip! A great adventure and a wonderful team! Awesome trip, top organisation! Thanks for this unforgettable experience! Gert, Elisabeth, and the entire staff of volunteers, it was a challenge for us, but even more for you. Perfection does not exist and adversity is a kind of opportunity. I was very tired but satisfied and a lot of new experiences came into my life: THANKS!!! 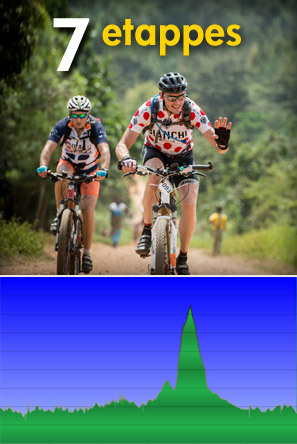 100 kilometers of cycling in the jungle of Togo is not comparable with cycling the same distances in Belgium. Some days we had to overcome 2000 altimeters, temperatures up to 45 degrees and extremely high humidity. All this combined with insomnia makes things more difficult than you could ever imagine. But all in all everything turned out even better than expected. It was a unique experience. Especially getting to know the cultural differences. The people there have little or nothing, but they’re really happy. The local people are very friendly and the joy in the children is captivating. To the organisation and staff, thanks for the hard work, it was fantastic! Thank you for this nice trip. It was a wonderful adventure with its ups and downs for everyone (illness and exhaustion) but overall it was an incredible experience that we will be talking about for at least another 10 years. Keep up with your organisation because it is really unique. Priceless! Thx for the memorable adventure!